Dedication • Location of wagon train massacre attains historic status. 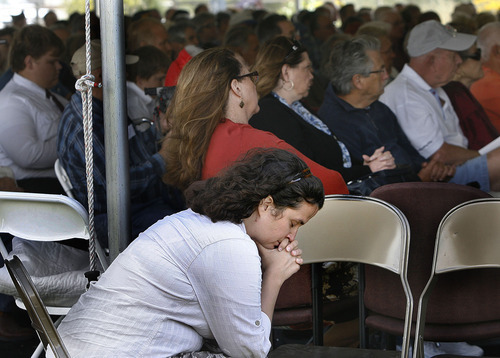 Scott Sommerdorf | The Salt Lake Tribune Heidi Casson listens to speeches at the Mountain Meadows massacre ceremony, Sunday, September 11, 2011. 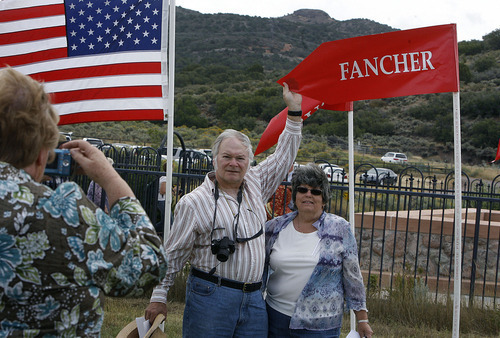 Scott Sommerdorf | The Salt Lake Tribune Peggy Crabtree and her husband Doug are photographed next to the Fancher flag at the Mountain Meadows massacre site, Sunday, September 11, 2011. Peggy is the great granddaughter of James Polk Fancher. Scott Sommerdorf | The Salt Lake Tribune A coupe strides through the field at the Mountain Meadow massacre site, Sunday, September 11, 2011. 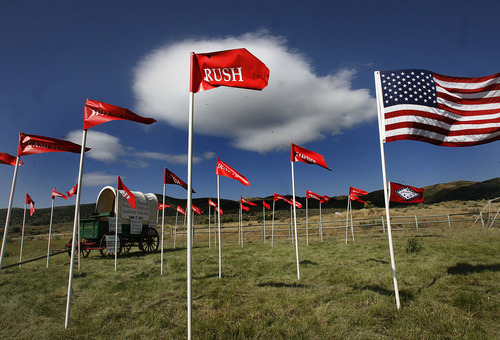 The field was full of flags bearing the names of each family who had members killed in the Mountain Meadows massacre. Scott Sommerdorf | The Salt Lake Tribune The plaque commemorating the Mountain Meadows massacre site, Sunday, September 11, 2011. Scott Sommerdorf | The Salt Lake Tribune A woman reads the list of victims on the program at the Mountain Meadows massacre ceremony, Sunday, September 11, 2011. 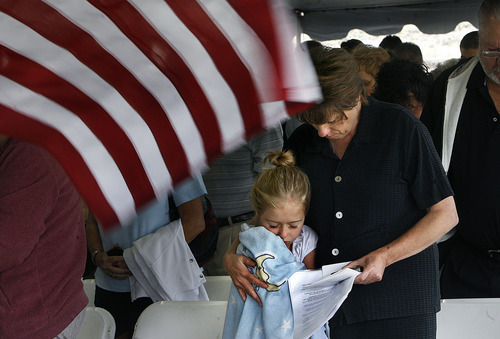 Scott Sommerdorf | The Salt Lake Tribune Becky Shields of Hurricane, and her 8 year old daughter Megan during a mement of silence at the Mountain Meadows massacre site, Sunday, September 11, 2011. Scott Sommerdorf | The Salt Lake Tribune Karen Fancher (right) hugs Dr. Shannon Novak, a forensic expert who helped to prove aspects of the massacre through examination of victim's remains. 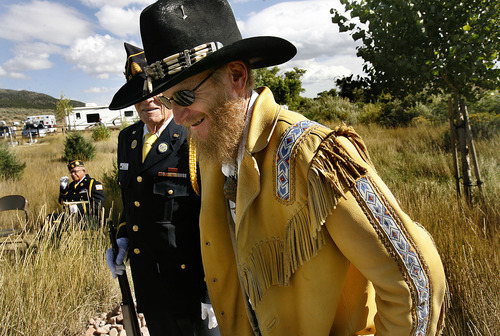 They met after the ceremony at the Mountain Meadows massacre site, Sunday, September 11, 2011. Scott Sommerdorf | The Salt Lake Tribune Scot Fancher, a relative of one of the families in the massacre, reflects while listening to a speech at the Mountain Meadows massacre ceremony, Sunday, September 11, 2011. Scott Sommerdorf | The Salt Lake Tribune James G. Lee, a great, great grandson of John D. Lee arrives at the Mountain Meadows massacre site, Sunday, September 11, 2011. Scott Sommerdorf | The Salt Lake Tribune Scott Fancher speaks while a persistent wind blows through the tent at the Mountain Meadows massacre site ceremony, Sunday, September 11, 2011. 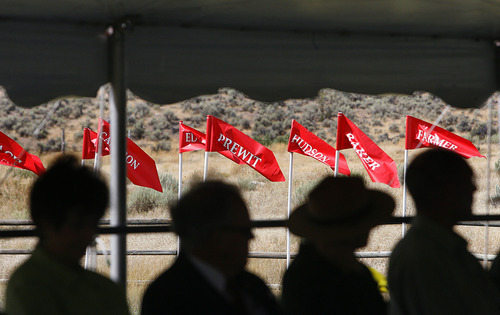 Scott Sommerdorf | The Salt Lake Tribune Flag bearing names of those families who had family members killed in the Mountain Meadows massacre fly at the site, Sunday, September 11, 2011. 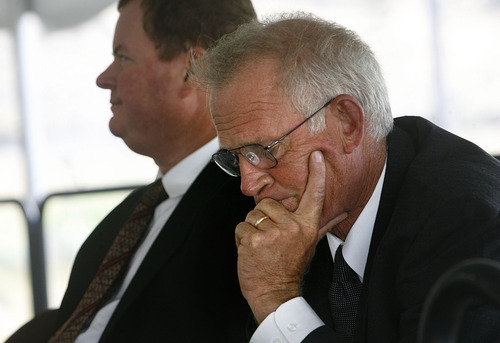 Scott Sommerdorf | The Salt Lake Tribune Veteran Douglas Johansen listens during the Mountain Meadows massacre site ceremony, Sunday, September 11, 2011. 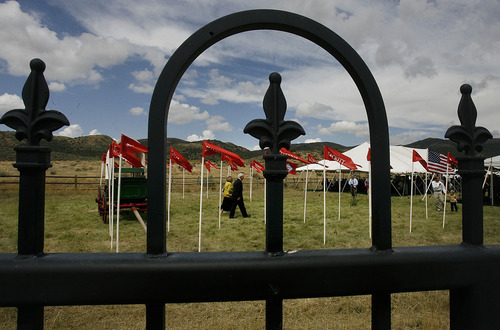 Scott Sommerdorf | The Salt Lake Tribune Flags bearing the names of families who had members killed in the Mountain Meadows massacre 154 years ago, flew outside the tent in which the ceremony was held, Sunday, Sept. 11, 2011. 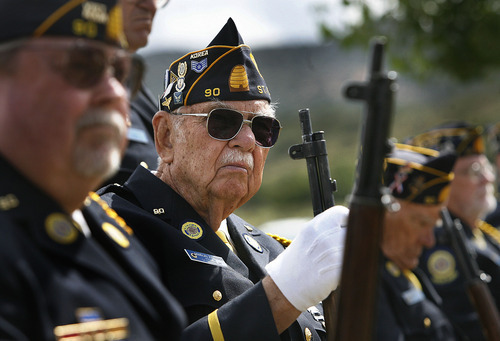 Scott Sommerdorf | The Salt Lake Tribune Korean War veteran Lloyd M. Berdsley plays taps at the Mountain Meadows massacre site, Sunday, September 11, 2011. Mountain Meadows • While the 10th anniversary of the Sept. 11 terrorist attacks was commemorated on Sunday, a tragedy on the same date 154 years ago in southwestern Utah was also remembered. 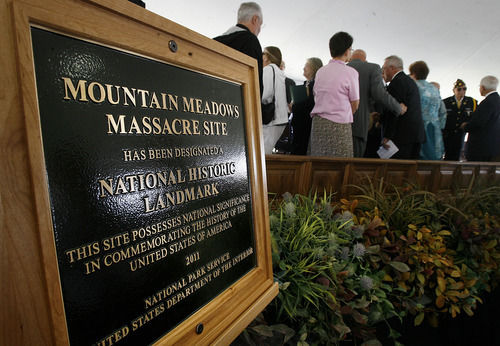 Under a spacious white tent, a Sunday ceremony marked the designation of the Mountain Meadows Massacre site as a national historic landmark. The site north of St. George is where a Mormon militia killed 120 Arkansas emigrants on their way to California in 1857. Most of those killed were women and children and the only survivors were 17 children who were 6 years old or younger. Emblazoned with the names of families who lost relatives in the massacre, 24 red flags snapped in the wind next to a burial monument at the siege site. Supporters worked for five years to make the site a historic landmark, and their efforts culminated in June when Interior Secretary Ken Salazar elevated the site to landmark status, one of 2,400 in the country. 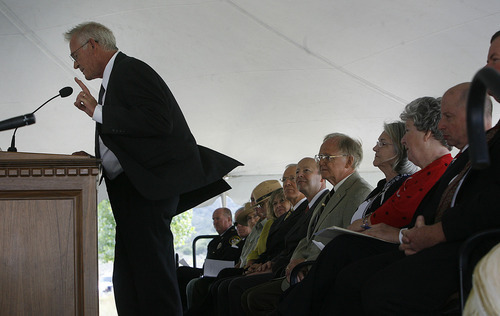 Jock Whitworth, the superintendent of nearby Zion National Park, stood in for Salazar, who was attending a memorial dedication in Pennsylvania for Flight 93. The plane crashed during the attacks 10 years ago when passengers on a hijacked jet tried to wrest control from terrorists. Whitworth said Salazar had wanted to attend, and read a letter from him. Salazar said he hopes the landmark will help to reconcile descendants of the victims and members of The Church of Jesus Christ of Latter-day Saints, allowing them to learn from each other through harmony and friendship. Whitworth then presented plaques to the LDS Church and U.S. Forest Service, which are the landowners and managers of the site. The plaques will be placed at the site. LDS Church historian and First Quorum of the Seventy member Marlin K. Jensen told the audience of about 200 that he was "grateful" for the designation and had great appreciation for the descendant groups and federal agencies that worked to achieve it. "It's an historic occasion," he said, then apologized for the killings, saying the actions by the militia went against all Christian principles that guide the LDS Church and its members, who are saddened by the event. He said during the process to make the site a landmark, he had the privilege of visiting the homes of descendant families in Arkansas. He learned about their Southern accents and music, he said, met their children and grew to love and admire them. Jensen also said he wonders what might have happened had the emigrants been allowed to pass through the area, without incident, to California. "It tugs at my heartstrings," said Jensen. "I can't tell you how sorry I am for what happened here so long ago, and that is shared by church leaders." Terry Fancher, president of the Mountain Meadows Association, said the efforts of many people over many years came together at Sunday's event. He recounted the dedication in 1955 of a monument to the victims in Arkansas, delivered by Juanita Brooks, author of Mountain Meadows Massacre, the first definitive study of the tragedy. He said she quoted from the Bible, extolling people to seek wisdom and the understanding that accompanies it. Scott Fancher, legal counsel for the Mountain Meadows Memorial Foundation, said the group has identified 15 of 17 burial sites of survivors, in addition to working on the landmark process. Members will continue their educational efforts, including fostering libraries dedicated to the massacre in several states. He said he is especially proud of the group's efforts to have a history of the massacre included in Arkansas textbooks. 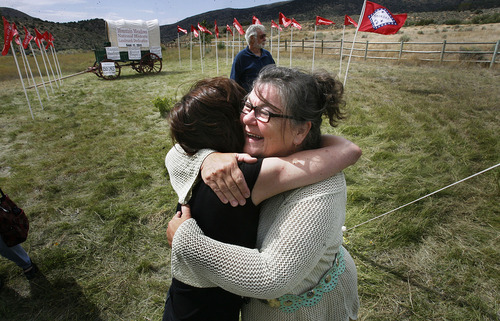 Patricia Norris, president of the Mountain Meadows Massacre Descendants, said when she first visited the site as a girl, she was "saddened" by its poor condition. "I thought that would be my first and last trip," she said. Instead, she joined efforts to restore the site so descendant family members could "feel better." Sunday culminated two days of activities, which included a Saturday dedication of the site where the men and boys were killed after being led away unarmed from the security of their wagons. 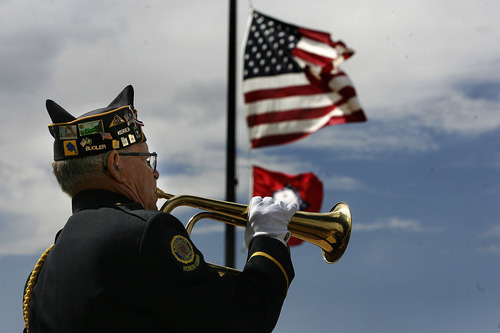 At Sunday's ceremony, members of American Legion Post 90 in St. George posted colors and fired a three-volley salute. 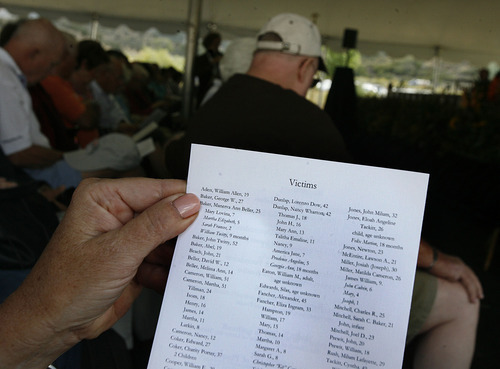 Names of the victims and survivors were read. Priscilla Dickson, a descendant of the Tackitt family that lost nine members in the massacre, said she appreciated the efforts of those who made the landmark a reality. "A resolution has finally been recognized," she said. "What happened here is a vital part of American history."